Not to be confused with Lishui (麗水市), the Zhejiang city with the same Hanja writing. Yeosu (Korean pronunciation: [jʌ.su]; Yeosu-si) is a city located on the southern coast of the Korean Peninsula in South Jeolla Province, South Korea and comprises the Old Yeosu City, founded in 1949, Yeocheon City, founded in 1986, and Yeocheon County which were merged into the current Yeosu city in 1998. The city of Yeosu consists of the Yeosu peninsula as well as 317 islands (49 inhabited, 268 uninhabited). Being midway along the southern coast of South Korea, it is flanked by Namhae County in South Gyeongsang Province to the east with a natural waterway, and the Bay of Suncheon to the west and northwest, the city of Suncheon sprawling along its banks. The city has three different City Halls. On 1 April 1998, the cities of Yeosu and Yeocheon, along with Yeocheon County merged to form the unified city of Yeosu. Thanks to the sea wind and warm current, Yeosu has cool summers and mild winters. Its ocean climate also brings Yeosu relatively longer springs and autumns than other regions. Yeosu is a city of history and loyalty where the headquarters of South Jeolla Province Navy Base was located, and the Great Admiral Yi Sun Shin improved upon the Geobukseon (turtle ship) to save the country while serving as the Navy Commander. Due to its appeal as an international ocean resort and tourist city, as well as its close proximity to the Yeocheon Industrial Complex, Yeosu has seen much development during the past several decades. In the 142nd General Assembly of BIE, held in Paris on 26 November 2007, the global community selected Yeosu as the host city for the 2012 World Expo. This Expo is Korea's second, following Daejeon's 1993 Fair. Wonchon-hyeon/Dolsan-hyeon was the name given to Yeosu in the 16th year of King Seong (538 A.D.) who was the king of Baekje Kingdom. The name changed to Haeub-hyeon/Yeosan-hyeon in 757 and to Yeosu-hyeon/Dolsan-hyeon in 940. 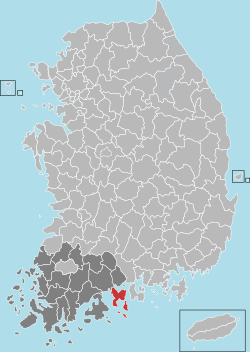 Beginning in 1479, the Joseon Dynasty's Naval Headquarters for eastern sector of Jeolla Province was located there. As such, it was the first base where Admiral Yi Sun-sin's fleet was based during the Imjin War which used the Turtle Ship or 'Kobukseon' which was built in Seon-so. In 1897, Yeosu was renamed Yeosu-myeon and included in the new county of Yeosu-gun. In 1914, Yeosu-gun merged with Dolsan-gun, further increasing its territory. Yeosu-myeon continued to grow and in 1931, Yeosu-myeon became Yeosu-eup. In 1949, Yeosu became a city. In 1998, Yeosu city merged with Yeochon city and Yeochon-gun, creating the unified city of Yeosu. In October 1948, the town of Yeosu was taken by South Korean soldiers who refused to take part in the suppression of the ongoing Jeju Uprising. In the harbour there is a full-size model of one of Admiral Yi's turtle ships, which are timber shelled vessels that were used with great success against the Japanese navy. Manseongri Beach near Yeosu has volcanic 'black' sand and is popular with Korean tourists. Recently, the famous Korean band Busker Busker made a song that's based on Manseongri Beach's night view. This made the site extremely popular with Korean tourists. There are public showers and restrooms as well as on-duty lifeguards. Many restaurants located along the beach have beach-side tables and serve various seafood dishes. It is possible to take ferries to many of the local islands for an authentic taste of rural Korean food. Dolsan bridge (돌산대교) has changing lights at night. It is a 450-metre-long (1,480 ft) bridge connecting downtown Yeosu with Dolsan Island. Dolsan Park (돌산공원) overlooks Dolsan bridge. The bridge is cable-stayed with 28 steel cables with diameters of 56–87 mm wired to a 62 m steel tower at the each end of the bridge. The bridge is 20 m above sea level. There are lots of seafood restaurants and romantic cafes around the area. * The Odongdo Island of Yeosu is one of the most spectacular spots to appreciate cammelias. There are 70 species of wild flowers that flourish here, a hill commemorating the plantation of the very first tree and a spacious grassy field. A small population of local Finless Porpoises are present here. Opened in December 2014, the Yeosu Cable Car connects Dolsan Island with Odongdo and offers excellent views of the area and the Dolsan Bridge. Big-O show is a famous show in Yeosu which features an ocean fountain event and a hologram show. The show consists of three parts. The fountain spouts in accordance with classic and jazz music. Unique to this fountain is a large round steel frame at its centre. Hanhwa aqua planet is a large aquarium that has four exhibition halls - marine life, aqua forest, ocean life, and alive museum. The main water tank performances include synchronized swimming and Pierrot's acrobatics. Hyangilam (향일암) is a temple, tha is composed of Daeungjeon and Kwon Yin-jeon, Yongwangjeon, Samsung-gak, Jonggak, Jaejabe and Jongmuil. It is on the hill of a steep mountain bordering the sea. and on the 31st and January 1 of each year, a festival of sunrise is held every year and it is a sunny spot where tourists from all over the country gather. The name of "Hwangilam" is derived from the fact that the thick camellia between the rocky cliffs of Geumo Mountain is blessed with the sunrise of the South Sea. Gejang, or marinated raw crab is a representative speciality of Yeosu and a traditional Jeolla cuisine dish. Dolsan 'gat kimchi' is also a speciality of Yeosu. Yeosu has a humid subtropical climate (Köppen climate classification Cwa) with very warm summers and cold winters. Rainfall is much heavier in the summer, with June to August recording over 200 millimetres (7.9 in) of rainfall per month. The highest temperature ever recorded is 37.1 °C (98.8 °F) on 20 July 1994 while the lowest temperature ever recorded is −12.6 °C (9.3 °F) on 16 February 1977. ^ "Kobukseon". Archived from the original on 25 March 2015. ^ 손, 봉석 (12 June 2012). 버스커버스커가 직접 그린 ‘여수밤바다’ 그림 화제. 경향신문. Retrieved 29 March 2017. ^ 황주찬 (2014). 낚시꾼들에겐 찬밥이지만 '귀하신' 몸입니다. Retrieved 11 January 2015. ^ Moon, Gwang-lip (14 July 2012). "Traditional cuisines to savor at the World Fair". Joongang Daily. Archived from the original on 16 June 2013. Retrieved 22 May 2013. ^ a b 기후자료 극값(최대값) 전체년도 일최고기온 (℃) 최고순위, 여수(168) (in Korean). Korea Meteorological Administration. Retrieved 12 January 2017. ^ a b 기후자료 극값(최대값) 전체년도 일최저기온 (℃) 최고순위, 여수(168) (in Korean). Korea Meteorological Administration. Retrieved 12 January 2017. ^ 평년값자료(1981–2010) 여수(168) (in Korean). Korea Meteorological Administration. Retrieved 2 May 2011. ^ "Climatological Normals of Korea" (PDF). Korea Meteorological Administration. 2011. p. 499 and 649. Archived from the original (PDF) on 7 December 2016. Retrieved 12 January 2017. ^ Julia Chan (20 March 2015). "KK-Portland sister city pact could see US craft beer coming to Sabah". The Malay Mail. Retrieved 21 March 2015. Wikivoyage has a travel guide for Yeosu.